BTC/USD bulls still can’t breach past $4,000 as price stuck at $3,990. BTC/USD price is stuck in between strong levels of resistance and support which hampers further movement. BTC/USD are struggling to breach past $4,000 as the price is stuck at $3,990. BTC/USD price is stuck in between strong levels of resistance and support which hampers further movement. 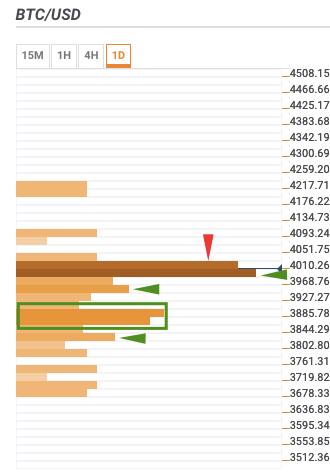 There is only one significant level of resistance, so if the bulls can breach past that, they have a clear path till $4,500. The BTC/USD daily confluence detector shows only one strong resistance level at $4,025. The confluence at that level is as follows - Hourly previous low, 10-day simple moving average (SMA 10), SMA 5, 15-min previous high, 4-hour Bollinger band upper curve, 15-min Bollinger band middle curve, daily Bollinger band upper curve, daily 23.6% Fibonacci retracement level, hourly previous high, 161.8% weekly Fibonacci retracement level, weekly pivot point resistance 2, and 15-min Bollinger band upper curve. $3,975: SMA 10, 4-hour Bollinger band middle curve, SMA 50, SMA 200, hourly Bollinger band middle curve, SMA 100, SMA 5, 4-hour previous low, 15-min Bollinger band lower curve, daily 38.2% Fibonacci retracement level, monthly 23.6% Fibonacci retracement level, and 15-min previous low. $3,950: Daily pivot point support 1, daily previous low, SMA 5, and 4-hour Bollinger band lower curve. $3,845-$3,880: Weekly pivot point support 3, daily Bollinger band middle curve, monthly 38.2% Fibonacci retracement level, weekly 61.8% Fibonacci retracement level, SMA 100, and daily 161.8% Fibonacci retracement level.